The Dive site Justin's Caves is an inshore rocky reef in the north Oudekraal area on the Atantic seaboard of the Cape Peninsula, near Cape Town in the Western Cape province of South Africa. Map showing the North Oudekraal dive site Justin's Caves. The site has spectacular topography and colourful ecology, and is justly one of the more popular shore dives of Cape Town. This site is in a Marine Protected Area (2004). A permit is required. Just inside the Karbonkelberg restricted area. 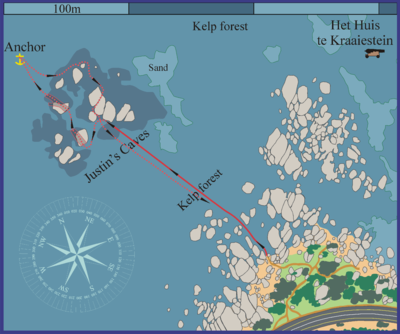 The site name "Justin's Caves" is partly descriptive of the small caves and spacious swimthroughs at the site, but it is not recorded who Justin was. The site has had this name since before 1983. The bottom is generally from about 8m to about 13 m. There is very little sand. You can find 15m over the flat reef to the north. Visibility varies significantly with the weather. It can be as good as 20m on a very good day, and this is usually associated with an upwelling following a south easterly wind. There can also be a surface layer with plankton bloom which may make the visbility near the surface far worse than below this upper layer, and this may be associated with a thermocline. Upwellings generally result in cold water. Visibility of 8m or more would be considered good. Large swell will result in strong surge and usually poor visibility. The Justins Caves group of rocks comprises huge granite corestone boulders in a cluster, with several swim-throughs, narrow gaps, walls, overhangs and caves. Hardly any sand bottom is visible between the rocks. Spectacular in good visibility. There is a large iron anchor thought to be from the wreck of Het Huis te Kraaiestein on the low granite outcrops north of the caves. There is hardly any kelp in this area and the reef life is limited to mostly Cape sea urchins, dark sea cucumbers, mussels and Spiny starfish. Further north from the anchor is a low boulder field at a depth of about 15m, where there is a bit more biodiversity. To the north east of the caves is an area of moderate to very large boulders stretching to Geldkis and including Mushroom Pinnacle about half way across. The kelp in this area is sparse and mostly confined to the tops of the taller rocks. Geology: Corestone boulders and outcrops of late Pre-Cambrian granite of the Peninsula pluton. The site is often at its best during or after south easterly winds, but strong south easterly winds (offshore) can make it difficult to swim back to shore at the surface. It is exposed to south westerly swells, and surge can be strong, particularly in the swim-throughs. The site is usually at it's best in summer, but there are also occasional opportunities in autumn and early winter. 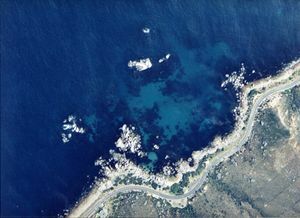 This is an area which sometimes has upwellings, caused by south easterly winds, resulting in clear cold water, which may develop an algal bloom after a few days of sunshine, which will reduce the visibility. Keep a lookout for times when the south west swell is low and short period, and the south easterly winds have just stopped, for a good probability of good diving conditions. There are no facilities provided. Security is no better than at any other roadside parking in the area. View of the site from the entry and exit point which is in the middle foreground of this photo. The caves are under the group of granite boulders in the background. Shore dive. Parking at the side of the road on outside of bend north of the Twelve Apostles Hotel near S33°58.941’ E018°21.594’. There is an entry/exit point directly opposite the caves at the bottom of a slope covered with rounded boulders of medium to small size at S33°58.910’ E018°21.571’. This gives the most direct route to the caves which are under the group of large granite boulders about 150m offshore. The gully is quite shallow over rounded sandstone boulders and there is a nice flat granite rock at the entry point to put gear on if the tide is low enough. If the tide is very low the kelp can be a bit of an obstacle, particularly in the gully, and the rocks can be slippery. An alternative entry and exit point which is far more protected from the south west swell is at Sandy Cove, about 50m to the north, but if the conditions are too rough at the entry described here, the caves will be very surgey. The first swimthrough referred to in the route description is under the second high rock from the left, and the main swimthrough is under the low rock just to the right of that in the photo. Access is over the small round boulders in the foreground and through a gap to the left of the gully. Swim out on the surface to just short of the high rock in the background. The gully is quite shallow and at low tide the kelp is a hassle. 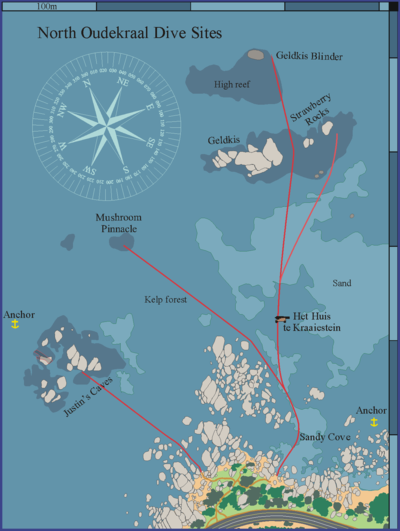 The site is not generally done as a boat dive, but if it is, the boat should stay out of the channel between the rocks and the shore, as unmarked divers use this area on the surface and at shallow depth, and there is a dense kelp forest. The ground is generally unsuitable for anchoring, and boats should not be left unattended at anchor. There is a large and fairly dense kelp forest on the way out and back, which can be a bit of an obstacle on the surface at low tide. The rocks at the caves are covered in the typical reef life of the area, with spectacular growths of sponges, soft and noble corals, sea fans and ascidians in the sheltered areas under overhangs and in the swimthroughs. Several swim-throughs and caves, and a large anchor from the historical wreck of the Dutch East Indiaman "Het Huis te Kraaiestein"
A good site for macro photography, and wide angle work if the visibility is good. Enter at the north-west facing gully at the end of the western branch of the main path. Swim out on the surface to the highest rock in the group. Dive and by keeping the high rocks on your right, follow the high rocks generally south. Go north through the swim-through at approximately S33°58.863 E018°21.475 then head past a curved hollow in the bottom, north to the main swimthrough at S33°58.848’ E018°21.473’. This swimthrough branches and has two exits to the north. Choose whichever you prefer. Fom the far side of this swimthrough, swim north again some 40m over fairly flat granite outcrops and see if you can find the large iron anchor, said to be from the wreck of the Huis te Kraaiestein, at S33°58.825’ E018°21.444’. Return south to the main group of rocks and spend your remaining time exploring the various gaps and overhangs among the boulders. You can follow the route shown on the map, by going around the reef with the exposed rocks to yout right and swimming through one of the narrow gaps between exposed rock on the north west side of the group, then keep the exposed rocks to yout left and swim south east until back at more or less the start point of the dive. Return to shore at shallow depth on a compass course of about 150° magnetic to avoid wind and kelp fronds. Exit at same point as entry. An alternative exit point is below the storm water outlet slightly further south west, but this involves a steep and occasionally slippery climb. particularly over the gravel and grass at the top. The south western part of this reef has some interesting holes and swimthroughs, but they are not mapped. There is a swimthrough which starts deep on the north eastern side of the south western group of rocks shown on the map, which changes depth py several metres before you come out quite shallow on the south west side of the reef. The surge in this swimthrough can be very strong, as the exit is directly exposed to the incoming swells. Take care if you choose to try this one. Cold water, Hot sunshine. Strong surge in gulleys and swim-throughs. Sea urchins. Strong offshore winds may develop over a short time (check the forecast). Dense kelp forests en route for shore dives (can be tiring to swim through at the surface). Rugged and slippery rocky access route. No special skills required. Reasonable fitness and agility are recommended due to the clamber over slippery rocks at the entry and the moderately long swim out to the site and back. The swimthroughs are reasonably spacious, but are an overhead environment for several metres, and the surge inside may be quite strong. One of the swimthroughs involves a significant change of depth. A light is recommended for looking into caves and overhangs, and because of the loss of colour at depth. A compass is recommended and the return should be done underwater if the wind picks up during the dive. Do not tow a SMB here unless you have a really good reason, as it will hook on kelp and keep you out of the caves. This page was last edited on 5 April 2011, at 11:52.